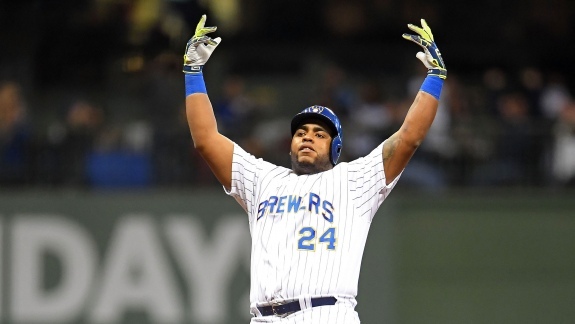 Jesus Aguilar's seventh-inning two-run double gave the Milwaukee Brewers a 4-2 lead over the San Francisco Giants. This evening, we will make our final trek to Milwaukee's Miller Park during the 2018 regular season. The Milwaukee Brewers (80-62, .563), who are knee-deep in the National League pennant race, will host the San Francisco Giants (68-74, .479). With only 20 games remaining, the second-place Brewers trail the Chicago Cubs (83-57, .593) by four games in the National League Central. Currently, the Brewers hold the first National League wild-card spot and have a 1 1/2-game lead over the St. Louis Cardinals (78-63, .553). Chris Stratton (9-8, 4.90 ERA), a 28-year-old righty, will make the start for the Giants. During his last start, he faced the New York Mets (63-77, .450) and suffered the loss. He lasted six innings and allowed only two earned runs on three hits. He did not walk a batter and fanned two. The 32-year-old righty, Gio Gonzalez (7-11, 4.57 ERA), will make his first start for the Brewers since being traded from the Washington Nationals (69-72, .489). During his last start with the Nationals, he faced the Philadelphia Phillies (74-66 .529) and was battered. Gonzalez pitched five innings and allowed six earned runs. He walked away with a no-decision. Looking toward the playoffs, the Brewers control their destiny. Following the series against the Giants, the Brewers will travel to Wrigley Field for a three-game series against the Cubs. That series will determine if the Brewers can make a legitimate move for a division title or will focus on the wild card. They also have one more three-game series against the Cardinals in late September. Fun Fact: The last time I watched the Giants play live, we traveled to AT&T Park to see them play the Nationals on July 31, 2016. Gio Gonzalez, then a Nationals pitcher, made the start. But the last time I saw the Giants play the Brewers was on May 27, 2011.